WARREN, NJ--(Marketwire - February 10, 2010) - ANADIGICS, Inc. (NASDAQ: ANAD) today announced the latest version of its highly successful dual-band CDMA power amplifiers (PAs) -- the AWC6323 -- designed for today's most advanced CDMA handsets and data cards for the world's leading wireless providers. For the first time, high performance directional couplers have been integrated into a dual band CDMA PA in the 3 X 5 X 1 (mm) footprint. The product also offers the lowest quiescent current for a CDMA PA in the industry which helps extend the battery life. The innovations built into the AWC6323 enable the latest generation handsets to provide an improved consumer experience. The AWC6323 is the flagship PA in ANADIGICS' portfolio of High-Efficiency-at-Low-Power (HELP™) family of CDMA PAs. The device is now ramping into volume production and complete evaluation kits are available upon request. "The AWC6323 has received tremendous response from our customers. Customers are particularly enthusiastic about the high levels of integration in a very small package. 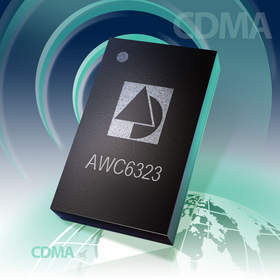 The innovations inherent to the AWC6323 help simplify design, reduce component count and save on board space. These attributes directly address the needs of today's advanced handsets and data cards," said Prasanth Perugupalli, Director of the Wireless RF Product Line at ANADIGICS. "ANADIGICS is also offering extensive support for our customers through a front-end reference design kit, utilizing the most commonly used filters and prescribed matching networks to aid in the phone board design and reduce time-to-market." efficiencies at several power levels during the phone operation. surface mount couplers placed on the phone board. smart phones and data cards. reliability, temperature stability and ruggedness. The AWC6323 will be on display at Mobile World Congress, Feb. 15-18 in Barcelona, Spain. For more information, visit the ANADIGICS booth located at Stand 2C19 in Hall 2 or visit www.anadigics.com.